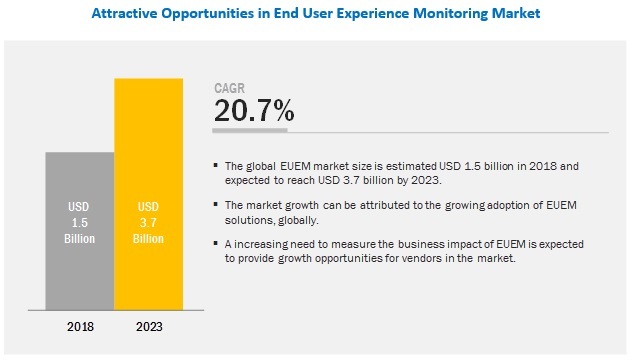 [141 Pages Report] The global end user experience monitoring (EUEM) market size is expected to grow from USD 1.5 billion in 2018 to USD 3.7 billion by 2023, at a Compound Annual Growth Rate (CAGR) of 20.7% during the forecast period. The growing number of agents to provide better end user experience, increasing need to measure business impact of EUEM, and changing end user expectations are major growth factors for the end user experience monitoring market. For organizations that have limited budgets, the cloud-based EUEM products are a good option, because of their speed and scalability. The cloud-based deployment model also provides a flexible service by offering on-demand data governance, as customers have to pay according to their utilization of services. Globally, large enterprises and Small and Medium-sized Enterprises (SMEs) are shifting toward cloud-based EUEM products to streamline their processes easily and minimize upfront costs. Organizations with employees between 1 and 999 are categorized under the SMEs segment. The adoption of EUEM products in SMEs is gaining traction, as these organizations are realizing the benefits of providing a good user experience to gain customers and keep up with the competition from large organizations. The websites and applications provided by the SMEs need to be robust and responsive, and should be capable of handling large requests during peak times. EUEM products help in keeping a tab on user trends and various other performance metrics that help organizations improve their websites and applications. SMEs face challenges such as the lack of capital, skills, and scalability. To overcome these challengers, SMEs have started adopting cloud-based EUEM products, as they help in cost saving and can be scaled dynamically as businesses grow. APAC is expected to provide significant growth opportunities during the forecast period. Rapid advancements in telecom infrastructure, cloud computing, and Internet of things (IOT) have led many organizations moving their focus toward providing good end user experience for their web and mobile applications. With the pressure to achieve greater business agility and satisfy their customers, end user experience has become the core of how many businesses operate nowadays. Organizations are working on optimizing both customer-facing and internal applications, and ensuring good end user experience for all enterprise applications. Major vendors in the EUEM market include CA Technologies (US), Micro Focus (UK), SAP (Germany), AppDynamics (US), IBM (US), Riverbed (US), BMC Software (US), Catchpoint (US), Dynatrace (US), New Relic (US), Oracle (US), Lakeside Software (US), Nexthink (Switzerland), Centurylink (US), ControlUp (US), Bitbar (Finland), eG Innovations (US), SmartBear (US), Stackify (US), Alyvix (Italy), AppNeta (US), Datadog (US), Rigor (US), TeamViewer (Germany), and Application Performance Ltd (UK). Catchpoint, a key player in the end user experience monitoring market, provides a comprehensive range of products. Catchpoint has also adopted organic growth strategies to maintain its leading position in the EUEM market. For instance, in April 2018, Catchpoint launched a new, free benchmarking service, which allows organizations to gain a glimpse into the performance (speed and availability) of their websites, mobile sites, and web applications when compared to the leaders in the industry. In November 2018, AppDynamics and ServiceNow partnered to bring about integration between their products. AppDynamics’ applications would now be able to provide metric data to ServiceNow’s Operational Intelligence. In November 2018, SAP signed a deal to acquire Qualtrics, an experience management software provider. The acquisition would help SAP in strengthening its experience management offerings. In October 2018, Riverbed Technology extended its Riverbed SteelCentral capabilities to provide enhanced visibility into cloud-based apps and networks, along with improved APM and Network Performance Management (NPM) capabilities. What are the upcoming industry applications for the end user experience monitoring market? The study involved 4 major activities to estimate the current market size of End User Experience Monitoring (EUEM) products and services. Exhaustive secondary research was done to collect information on the market, the peer market, and the parent market. The next step was to validate these findings, assumptions, and sizing with industry experts across the value chain through primary research. Both top-down and bottom-up approaches were employed to estimate the complete market size. After that, the market breakup and data triangulation procedures were used to estimate the market size of the segments and subsegments. In the primary research process, various primary sources from both the supply and demand sides were interviewed to obtain qualitative and quantitative information for this report. 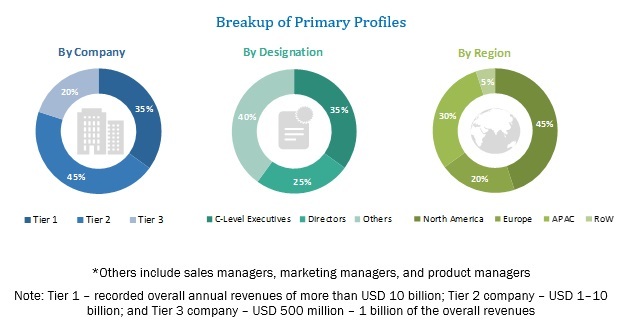 Primary sources from the supply-side included industry experts, such as Chief Executive Officers (CEOs), Vice Presidents (VPs), marketing directors, technology and innovation directors, and related key executives from various key companies and organizations providing EUEM products and services. The primary sources from the demand side included the end-users of EUEM products, which included Chief Information Officers (CIOs), IT technicians and technologists, and IT managers at public and investor-owned utilities. After arriving at the overall market size using the market size estimation processes as explained above the market was split into several segments and subsegments. To complete the overall market engineering process and arrive at the exact statistics of each market segment and subsegment, the data triangulation and market breakup procedures were employed, wherever applicable. The data was triangulated by studying several factors and trends from both, the demand and supply sides, in the EUEM market.